The future Superman and Justice League show their present counterparts, sans present day Supes, a part of the omniverse that is a virtual utopia where they are aiding the rebuilding of the multiverse after a great war. Everything, including Gotham City, looks sunny, bright and full of life. 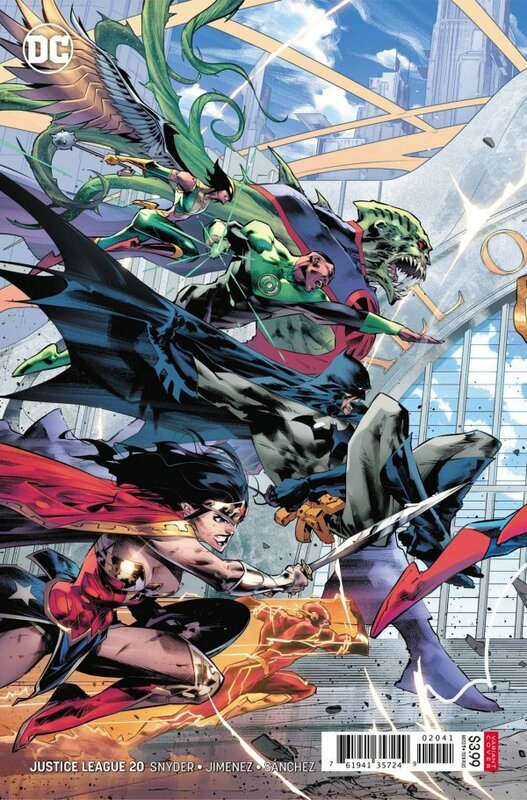 However, as Shayne, the son of Hawgirl and Martian Manhunter, reveals to the heroes who become his parents, things are not what they seem. It all could be connected to what Jarro, the tiny Starro in a jar, reveals to Starman and Mera. An outside force has made a deal with Mister Mxyzptlk. 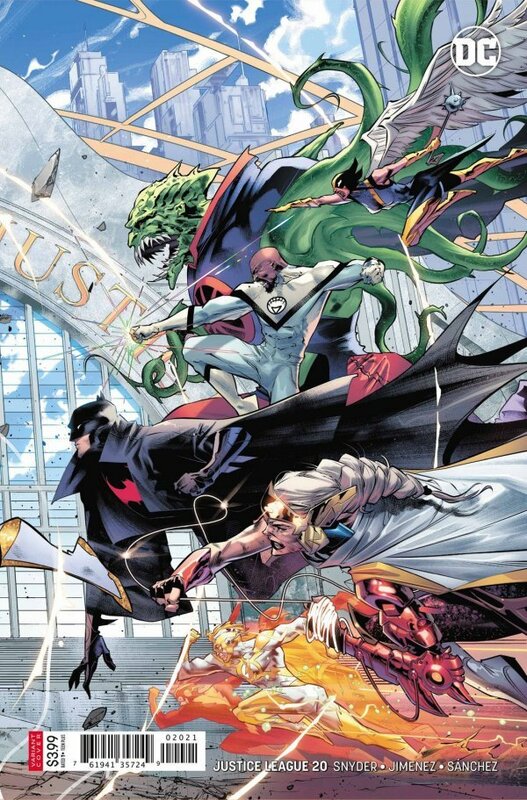 The Justice League could very well be in a trap from which they cannot escape in the Sixth Dimension. As the Legion of Doom tries to get their own Fifth Dimension imp, present day Superman is doing everything he can to escape the dark, desolate area where he finds himself. Suddenly an old saying comes true. If you travel long enough, you will meet yourself. Superman has met himself at this moment. Future Superman wants to talk to him. What will he reveal? What has Shayne shown Hawgirl and Martian Manhunter? Who is working with Mister Mxyzptlk? Story - 5: While some secrets are kept from readers, Scott Snyder and Jorge Jimenez continue to pique our interest in this story arc. We want to know what happens and continue reading. Every good creative team should do this, and they do it in spades. Snyder, in particular, upon reading some of his past work, has become a master of the twist ending, modern comics' answer to Serling or Hitchcock, if you will. I should have given his previous books a look much sooner. They make me appreciate Justice League even more than I already do. Art - 5: Jorge Jimenez pulled out all the stops this time around, giving us breathtaking images in this issue. He seems influenced by Jim Lee and Greg Capullo, but he also adds his own touches to the art. 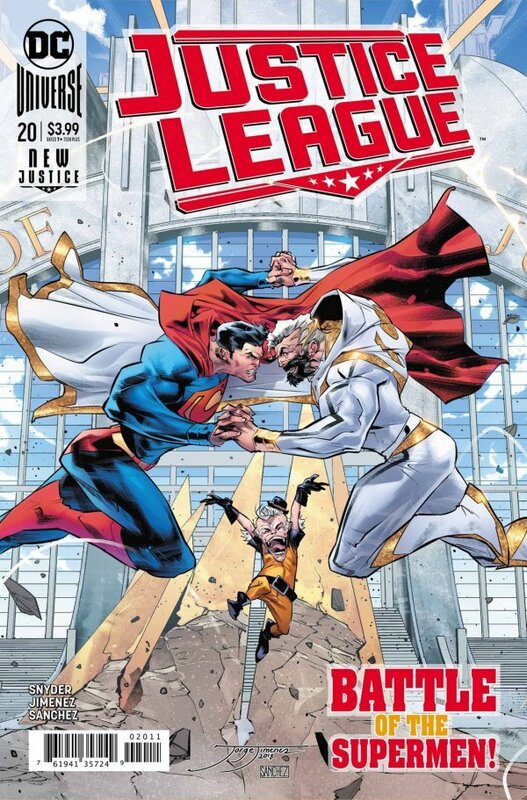 If Jimenez stays with this book for a long time, he and Scott Snyder could really be a Justice League creative team fans talk about for many years to come. Cover Art - 5: While I prefer the variant cover this time around, which is rare, This cover, if you'll pardon the pun, does this issue and this series justice. Variant Cover Art - 5: It's an expansion of the main cover, and perhaps a bit of a spoiler. Still, it's fantastic work on Jorge Jimenez's part. His style fits well for this series and its covers.